Motherwell endured their 11th defeat out of 11 games against Scotland’s top four clubs this season when they crashed 3-0 at home to Hearts on Saturday. The result hinged on the straight red card handed to Motherwell midfielder Carl McHugh, with the score 0-0 early in the second half, for a heavy challenge on Don Cowie. Esmael Goncalves shot wide for Hearts early on before Louis Moult’s header at the other end came back off the underside of Hearts’ bar after a Richard Tait cross, but offside was given in any case. Hearts’ Jamie Walker then shot just too high after dispossesing new Motherwell signing Zak Jules. Walker shot into the side netting after a 20th minute cross had only been partially cleared by the Steelmen. Hearts continued to boss the game and Malaury Martin had a 20-yard free-kick on 28 minutes scrambled round the post by ‘Well keeper Craig Samson. Yet the Steelmen almost broke the deadlock when Hearts keeper Jack Hamilton flapped at Stevie Hammell’s corner from the right and the ball broke to the returning Lionel Ainsworth, whose goalbound shot was cleared off the line. The home side won a late first half free-kick but Moult’s right footed shot from 20 yards flew just wide. Motherwell endured a second straight red card in successive weeks when midfielder Carl McHugh was dismissed for a lunge at Don Cowie in midfield. The home side reorganised with two substitutions, Lee Lucas coming on for Hammell and the returning Stephen Pearson replacing Ainsworth. 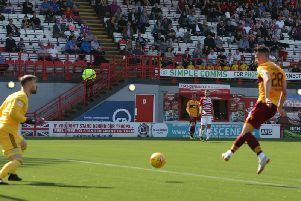 Hearts went ahead in fortuitous fashion just seconds later when a long range shot by defender Alexandrios Tzilois was deflected over Samson’s head and into the net courtesy of a deflection off Keith Lasley. And it was Lasley who almost got his team level when a 65th minute free-kick was cleared to him at the edge of the box, but the 37-year-old’s snap shot went just wide. The Jambos had the chance to kill ‘Well off but Goncalves shot well wide after Lennard Sowah’s centre. Goncalves then had a run and shot but his effort was weak and Samson saved easily. But the killer second goal did arrive on 84 minutes when a m’Well attack broke down and Hearts advanced swiftly to the other end where Goncalves shot home after a fine pass by sub Moha Choulay. The Edinburgh side added a third goal on 87 minutes when Goncalves shot low through Samson after Choulay’s cross from the right.